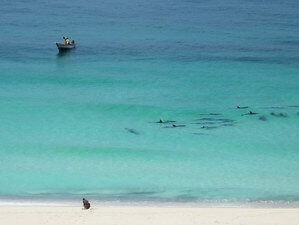 For free diving we would recommend the whole northern coast of Socotra where it is quite easy to enter the sea. 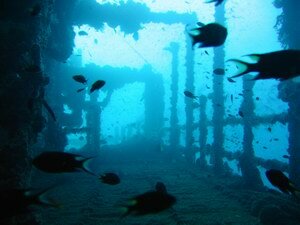 Here, the sea floor is made of volcanic rocks covered with coral features. The visibility is average. Sea currents are also possible, which may be very strong in some places. When travelling by boat from Qalansiya to Shuab Bay you can make a stop at one of numerous coves formed by the rocks falling in the sea. 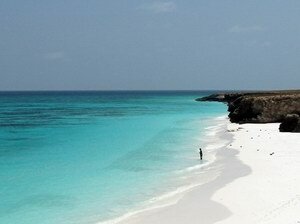 We would recommend those who like snorkeling to take a diving mask and a snorkel to Socotra. 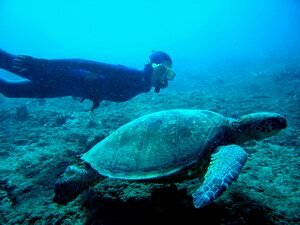 It is only possible to rent snorkeling equipment in DiHamri Camping, however, the underwater world of this place is not to be much to explore. For free divers we arrange trips to Darsa, Samha and Abd al Kuri islands, were you can meet big schools of mantas. Here is one of the fishiest places of the Archipelago. Except the underwater world these islands are also famous for their unique flora and fauna. Such trips are possible early October and in the period from the end of February to April. 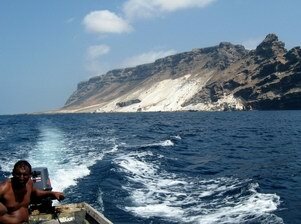 If you want to take part in such an expedition or just to dive on Socotra you can write us and discuss all the details. Julia Petrik - the first Russian freediving champion, international freediving medalist, the founder of the Russian branch of the international association for development of freediving (AIDA), Master Instructor and Judge with AIDA and a yoga instructor. Mastermind of new directions "Yoga + Freediving", "Ice Freediving", "Cave Freediving", "Freediving for Children", "Underwater Modelling School" and "Underwater Theatre". Participant of numerous television and video projects. Meeting at the airport and receipt of a visa, transfer to Borj al Salam 4* Hotel. Guided sightseeing tour around Sanaa: vising Military and Historic Museums, walking through the Old City and an abandoned Jewish village, seeing the new President’s Mosque in Sanaa. Transfer to the north-eastern part of the island. After dinner – diving from a boat. Spending the night at Rush camping. In the morning– diving from a boat. After dinner – seeing Archer sand dunes and the Cape of Ras Erissel, transfer to Qalansiyah fishing village from where we will go by boat to Shuab Bay, the best beach of the island. On the way – fishing and diving. Having fish for supper and spending the night in tents on the beach. Diving to the “Sunrise” wrack lying on a sandy-bottom at a depth of 25-30 m in Shuab bay. Watching a great variety of big fish, skates. Having lobsters for supper and spending the night in tents on the beach. From Shuab Bay we will go by boat along wild and deserted Net beaches. On the way – watching dolphins, fishing and diving. Staying with local community for the night in Di Sebro. From Di Sebro we will go to Darsa Island for the whole day. It is famous for its dazzling white sand and schools of mantas that can be often seen near the island at this time-of-year. Coming back to Di Sebro for supper prepared by local community. Here you will be given a very delicious bread flavoured with honey which is considered to have a healing power. Spending another day with mantas on Darsa Island and continue enjoying local community’s hospitality in Di Sebro where we will stay for another night on the shore of the Indian ocean. Except Darsa we will also see Berber waterfalls and the Cape of Qatanhan. Visiting the central part of the island – Dixam Plateau. Here, at the edge of a deep canyon, you will find yourself in a habitat of Dragoon trees producing a red resin famous for its medicinal properties. We will go down to the canyon, have dinner and swim in a fresh water pool. Transfer to Hadiboh, the capital of the island. Spending the night at a hotel. Flight to Sanaa by Felix airline. Guided tour to Wadi Dahr (the palace of Imam's family), shopping and having supper in Sanaa, having a rest at the hotel. Water and beverages during day trips.